We will tell you how Nginx works, speak about the concepts behind it, how could you optimise it to boost up your app's performance, and how to set it up to have it up and running. Basics concepts: get to know the difference between directive and context, the inheritance model, and the order in which Nginx picks server blocks and locations. Performance: tips and tricks to improve speed. We will discuss gzip, caching, buffers, and timeouts. SSL setup: set up the configuration to serve content through HTTPS. We aimed to create a series in which you can easily find the proper configuration for a particular topic (like gzip, SSL, etc. ), or simply read it all through. For the best learning experience, we suggest you set Nginx up on your own machine and fiddle with it yourself. In the early days of TCP, engineers faced the danger of congestion collapse. Quite a few solutions emerged as a way of preventing this, and one of them was an algorithm proposed by John Nagle. Nagle’s algorithm aims to prevent being overwhelmed by a great number of small packets. It does not interfere with full-size TCP packets (Maximum Segment Size, or MSS in short), only with packets that are smaller than MSS. Those packages will be transmitted only if the receiver successfully sends back all the acknowledegments of previous packages (ACKs). And during the wait, the sender can buffer more data. During that time, another proposal emerged: the Delayed ACK. In TCP communication, we send data and receive acknowledgements (ACK) that tell us that those data were delivered successfully. A delayed ACK tries to resolve the issue where the wire is flooded by a massive number of ACK packages. To cut this number, the receiver will wait for some data to be sent back to the sender and include ACK packages with those data. If there are no data to be sent back, we have to send ACKs at least every 2 * MSS, or every 200 to 500 ms (in case we are no longer receiving packages). You might have already noticed that this can lead to some temporary deadlocks on the persisted connection. Let's reproduce it! The initial congestion window equals 2. The congestion window is part of another TCP mechanism called Slow-Start. The details are not important right now, just keep in mind that it restricts how many packages can be sent simultaneously. In the first round-trip, we are allowed to send 2 MSS packages; in the second, 4 MSS packages; in third, 8 MSS, and so on. 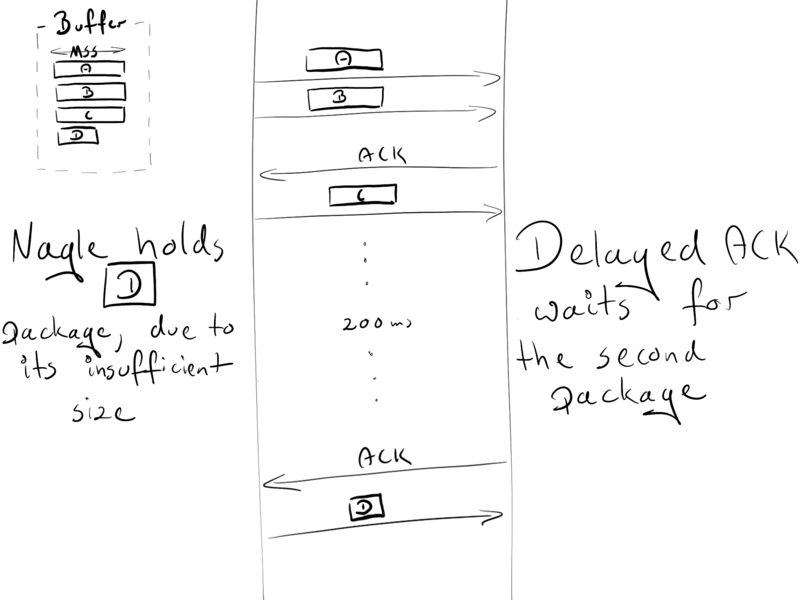 Due to the initial congestion window size, the sender is allowed to transmit two packages: A and B. The receiver sends an ACK upon obtaining both packages. After 200ms, the receiver sends the ACK for the C package. The sender receives the ACK and sends the D package. During this exchange, a 200ms lag was introduced due to the deadlock between Nagle and Delayed ACK. The Nagle algorithm was a true saviour in its time and still provides great value. However, in most cases, we won’t need it for our website, and it can be safely turned down via adding the flag TCP_NODELAY. Enjoy your 200 ms gain! For some nitpicky details, I suggest that you read this great paper. This involves two context switches (read, write) which make a second copy of the same object unnecessary. As you may see, it is not the optimal way. Thankfully, there is another system call that improves sending files, and it's called (surprise, surprise! ): sendfile(2). This call retrieves an object to the file cache, and passes the pointers (without copying the whole object) straight to the socket descriptor. Netflix states that using sendfile(2) increased the network throughput from 6Gbps to 30Gbps. tcp_nopush is opposite to tcp_nodelay. Instead of pushing packages as fast as possible, it aims to optimise the amount of data sent simultaneously. It will force the package to wait until it gets its maximum size (MSS) before sending it to the client. This directive only works, when sendfile is on. How many processes should I have? The worker_process directive defines how many workers should be run. By default, this value is set to 1. The safest setting is to use the number of cores by passing auto. But still, due to Nginx's architecture, which handles requests blazingly fast, we probably won’t use more than 2-4 processes at a time (unless you are hosting Facebook, or doing some CPU-intensive stuff inside nginx). This directive is directly related to worker_process is worker_connections. It specifies how many connections can be opened by a worker process at the same time. This number includes all connections (e.g. connections with proxied servers), and not only connections with clients. Also, it is worth keeping in mind that one client can open multiple connections to fetch other resources simultaneously. This system limit must be tweaked in accordance with worker_connections. Any incoming connection opens at least one file (usually a two-connection socket and either a backend connection socket or a static file on disk). So it is safe to have this value equal to worker_connections * 2. Nginx, fortunately, provides an option of increasing this system value within the nginx config. To do so, add the worker_rlimit_nofile directive with a proper number and reload the nginx. worker_rlimit_nofile 2048; # Changes the limit on the maximum number of open files (RLIMIT_NOFILE) for worker processes. worker_connections 1024;   # Sets the maximum number of simultaneous connections that can be opened by a worker process. keep_alive_timeout (more on that later) + avg_response_time tells us how long a connection is opened. We also divide it by 2, as you will usually have 2 connections opened by one client: one between nginx and the client, the other one between nginx and the upstream server. Enabling gzip should significantly reduce the weight of your response, thus it will appear faster on the client side. Gzip has the different level of compressions: from 1 to 9. Incrementing this level will reduce the size of the file, but also increase resources consumption. As a standard, we keep this number between 3 and 5, because increasing the number will give very small gains but significantly increase the CPU usage. Here is an example of compressing the file with gzip with different levels. 0 stands for an uncompressed file. This directive tells nginx to use gzip only for HTTP 1.1 and above. We don’t include HTTP 1.0 here, because for the 1.0 version, it is impossible to use both keepalive and gzip. You need to decide which one you prefer: HTTP 1.0 clients missing out on gzip or HTTP 1.0 clients missing out on keepalive. Caching is another thing that can speed up requests nicely for returning users. The configuration above seems to be sufficient. However, there is one caveat when using the public cache. Let’s see what will happen if we stored our asset in a public cache (e.g. CDN) with URI as the only identifier. In this scenario, we also assume that gzip is on. Finally, the file will be returned to the client. Now, the new browser sends the same request to the CDN, asking for netguru.com/style.css, expecting a gzipped resource. As CDN only identifies resources by the URI, it will return the same uncompressed resource for the new browser. The new browser will try to extract a non-gzipped file and will get garbage. If we could tell a public cache to identify a resource based on URI, and encoding, we could avoid this issue. And this is exactly what Vary Accept-Encoding; does. It tells a public cache that a resource can be distinguished by a URI and an Accept-Encoding header. The client_body_timeout and client_header_timeout define how long nginx should wait for a client to transmit the body or header before throwing the 408 (Request Time-out) error. 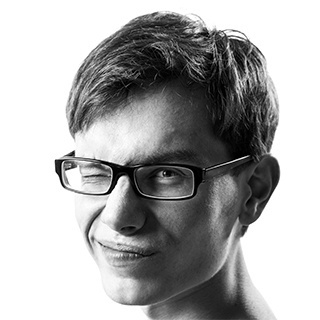 send_timeout sets a timeout for transmitting a response to the client. The timeout is set only between two successive write operations, not for the transmission of the whole response. If the client does not receive anything within this time, the connection is closed. Be careful when setting those values, as too long waiting times can make you vulnerable to attackers, while too short times will cut off slow clients. Sets the buffer size for reading the client's request body. In case the request body is larger than the buffer, the whole body or only its part is written to a temporary file. For client_body_buffer_size, setting 16k is enough in most cases. This is yet another setting that can have a massive impact, but it has to be used with care. Put too little, and nginx will constantly use I/O to write remaining parts to the file. Put too much, and you will make yourself vulnerable to DOS attacks when the attacker could open all the connections, but you are not able to allocate a buffer on your system to handle those connections. If headers don’t fit into client_header_buffer_size then large_client_header_buffers will be used. If the request also won’t fit into that buffer, an error is returned to the client. For most requests, a buffer of 1K bytes is enough. However, if a request includes long cookies, it may not fit into 1K. If the size of a request line is exceeded, the 414 (Request-URI Too Large) error is returned to the client. If the size of a request header is exceeded, the 400 (Bad Request) error is thrown. Sets the maximum allowed size of the client request body, specified in the “Content-Length” request header field. Depending on whether you want to allow users to upload files, tweak this configuration to your needs. The TCP protocol, on which HTTP is based, requires performing a three-way handshake to initiate the connection. It means that before the server can send you data (e.g. images), three full roundtrips between the client and the server need to be made. For another request, you will have to perform this whole initialisation once again. If you are sending multiple requests over short periods of time, this can add up fast. And this is where keepalive comes in handy. After the successful response, it keeps the connection idle for a given amount of time (e.g. 10s). If another request is made during this time, the existing connection will be reused and the idle time refreshed. keepalive_disable msie6;        # disable selected browsers. # The number of requests a client can make over a single keepalive connection. The default is 100, but a much higher value can be especially useful for testing with a load‑generation tool, which generally sends a large number of requests from a single client. # How long an idle keepalive connection remains open. We'll be more than happy to see some feedback or discussion, so feel free to leave comments or get in touch in any other way! Did you like the tutorial? Do you have some suggestions on what subject we should take up next? Or maybe you spotted a bug? Let us know and see you next time!